SYFA conference tackled the marine debris challenge and cyber security among other topics. The Synthetic Yarn And Fabric Association (SYFA) recently held its annual Spring Conference at the Sheraton Charlotte Airport Hotel in Charlotte, N.C. 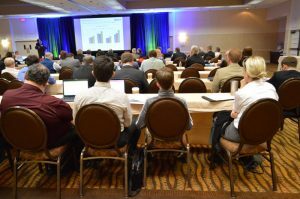 The conference’s “USA Textile Technologies: New Materials, Design and Applications” agenda featured speakers covering a wide variety of technology topics in addition to an economics update and review of the current climate for technical textiles. Alasdair Carmichael, Carmichael International, addressed the hot topic of fibers as a contributor to marine debris; while Andrea Ferris, co-founder, Intrinsic Textiles Group LLC, discussed an innovative solution developed to prevent microfiber pollution and unrecycled man-made fiber textiles that are sent to the landfill. Intrinsic’s CiClo™ Technology — which is an easy to implement, upstream solution, according to the company — allows polyester to biodegrade more like natural fibers in wastewater treatment plants and landfill conditions. Jim Hemsley, IS manager, Techmer PM LLC, also highlighted the importance of cyber security — that is protecting computer systems from theft and damage to hardware, software or information as well as service disruption — for textile companies. It’s an often-overlooked necessity, which is becoming more important than ever in the age of Industry 4.0 with internet-connected machinery. Conference sponsors for the spring event included Gold Sponsor Premiere Fibers Inc.; Silver Sponsor Pulcra Chemicals LLC; Bronze Sponsors Burlington, DAK Americas LLC and PolySpinTex Inc; and Patrons & Exhibitors Sponsors 4M Plants S.r.l., Clariant Masterbatches, The Filament Factory LLC, Goulston Technologies Inc., Milliken & Company, National Council of Textile Organizations, Unifi Manufacturing Inc. and William Barnet & Son LLC. The next SYFA Conference will be held November 29-30, 2018.